Home Enlivening Keeping it real, is speaking your truth. Keeping it real, is speaking your truth. Stay true to who you are, especially when you are engaging in conversation. Never say sorry or apologize for being your authentic self. Feeling good in your own shoes is about honouring your Soul. It takes courage to be confident with our words and actions sometimes. Especially if we want to step outside of the norm and just be ourselves. We are taught from the start to act a certain way, to communicate what is expected of us and to live how society deems acceptable. Do you ever feel like your living a movie sometimes, wandering around like a pre-programmed robot? It is time for all of us to wash away the conditioning we have placed upon our minds. It is about time that we begin to connect to our inner selves. Lets free our Spirit so we can express our true character, with ease and confidence. You are perfect just the way you are, all of your imperfections make you beautiful in your own skin, inside and out. You were born with a unique, fascinating, and alluring Soul. Let yourself shine today, and every day forward. Be yourself, the truth of who you are. 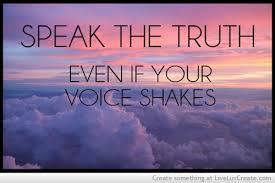 Get to know the real ‘you’, and speak your truth, even if you hear your voice shake sometimes.